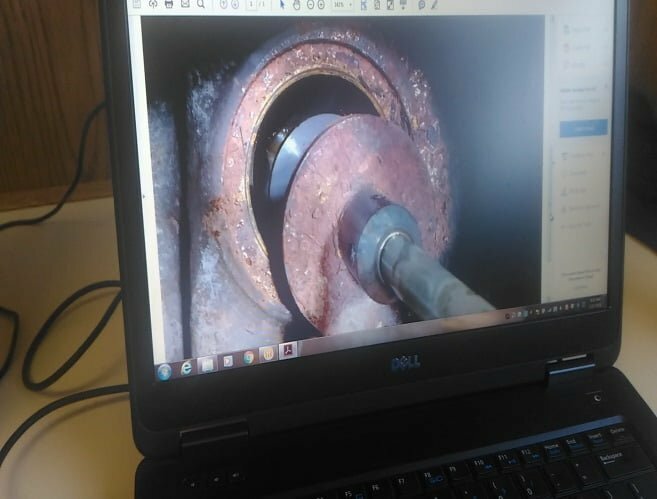 Appropriate preservation maintenance helps verify that equipment operates as intended during commissioning and throughout subsequent operation, minimising any production delays due to equipment quality issues. It also helps prevent the invalidation of equipment warranties by verifying adequate preservation prior to operation can be demonstrated and early involvement from the Operations / Maintenance team increases familiarity and ownership of equipment. At the start of a project, consideration should be given to devising a Preservation Philosophy and holding a Preservation Workshop across multiple project teams (Engineering, Construction, Commissioning, Start-up and Operations) to gain a common understanding and to understand how Preservation shall be managed throughout the project. Tools such as a clear definition, problem tree, vision, mission statement, values and RACI charts can help achieve this. 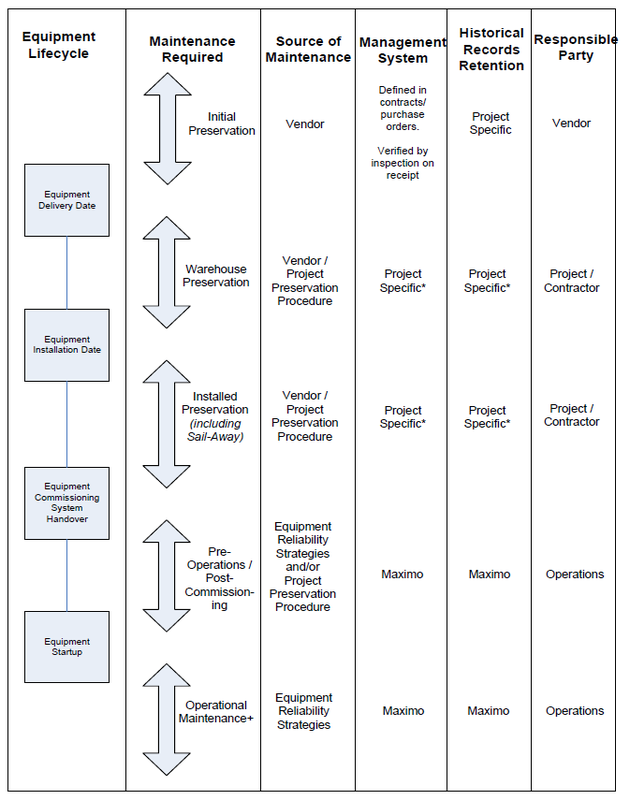 The categories of preservation maintenance and the requirements, summarized in Figure 1, should be considered in developing the associated procedures. Initial Preservation – covers the application of preservatives, the fitting of specified protection to equipment and the appropriate packing by suppliers prior to delivery, to prevent damage to the equipment during FAT, transport and installation stages. The re-application of preservation if it is disturbed during the installation process. Prolonged durations for sail-away, during which appropriate preservation is required. For each project, a preservation procedure should be prepared. The preservation procedure should detail how the preservation maintenance will be identified and how this will be implemented, including initial preservation measures, warehouse preservation, installed preservation and pre-operations maintenance activities. Preservation procedures shall identify and apply appropriate measures to confirm that equipment is maintained in a fully serviceable condition between leaving the supplier until being brought into full operation. This includes the aspects of packing, storage, transport, warehousing, construction, commissioning, hook-up, dynamic commissioning, installation and lying idle after installation. The Figure 2 and 3 show some examples of equipment damage from an ammonia plant project resulting from compromised equipment preservation. 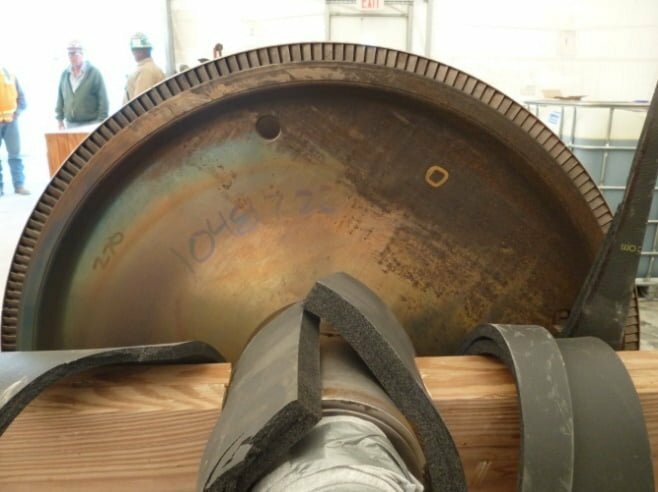 The project experience the importance of a robust equipment preservation program, thorough plant pre-start-up checkout, and effective pre-commissioning practices. Damage caused by compromised equipment preservation resulted in additional project costs and numerous delays to the plant precommissioning, commissioning, and initial start-up schedules. The initial preservation shall be the responsibility of the vendor. However, the Vendor should be informed of the project duration, phases and geographical locations of construction and Hook-up. This can aid the vendor in producing a preservation strategy for the equipment which is relevant to the project. The condition of all equipment shall be inspected on receipt, including the condition of external packaging and any protective covers, plugs or coatings. Inspection of crated equipment shall have its package reinstated where the package has been opened for inspection and re application of rust preventative or lubrication to internal components. The status of equipment preservation during the receipt inspection shall be recorded in the specified Preservation Maintenance Management System. The primary source of preservation maintenance requirement should be those supplied by the vendor or OEM. However, the project should also define minimum preservation requirements, based upon the equipment type, which can be applied in the absence of detailed vendor requirements. To aid preservation, it is essential that all equipment has appropriate storage facilities (e.g., temperature / humidity-controlled environment, power supply for heaters, cover from the elements, storage of items on wooden pallets / sleepers rather than directly on the floor, adequate supply of replacement desiccant). Where possible, materials should be segregated in storage (e.g., keep batteries and electrical equipment separate from heavy rotating and static equipment). The project should produce a detailed schedule which lists all the equipment and material which is subject to storage/preservation activities and defines the frequency at which each action shall be implemented. Commissioned and non-operational for an extended period. Consideration should be given to equipment that may contain process or other fluids from commissioning (e.g., hydrotest fluids). These should have been drained and dried appropriately as part of commissioning, but preservation should consider issues, such as whether stagnant pockets of water may remain leading microbial induced corrosion. Equipment that is operational from commissioning should be maintained according to the appropriate equipment reliability strategies. The scheduled start dates in CMMS System for maintenance routines should be assigned from the system handover date. Preservation maintenance that was used successfully during the earlier project phases. Relevant preservation maintenance defined in the project preservation guidelines. CMMS System is populated and available to plan maintenance as soon as equipment is commissioned and handed over to operations. Appropriate triggers are in place for operational maintenance routines to be active, or appropriate first due dates are set in CMMS System based upon whether the maintenance should be active from commissioning handover or from operational start-up. Appropriate triggers are in place to stop any temporary preservation maintenance in CMMS System and start operational maintenance in its place.